A glass of steaming milky syrupy tea is best served cut. One by two or two by three, it embodies the spirit of sharing and camaraderie (and more significantly a resource crunch). Come, have a sip. Cutting the Chai has moved to a new domain: cuttingthechai.com. You can get in touch with Soumyadip at www.soumyadip.com. The issue dated October 18, 1995 was Outlook's inaugural issue and the cover page read "First ever opinion poll in Kashmir. 77 percent say no solution within Indian constitution." 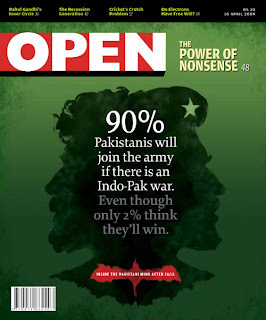 Fourteen years later, another magazine, issue dated 10 April 2009, carries the text on its first ever cover "90% Pakistanis will join the army if there is an Indo-Pak war. Even though only 2% think they'll win." See any similarities? I see two. When you don't have anything big enough for your launch issue, go for an opinion poll. Some stats would always suit your needs (depending on the way you look at it). And the second, the newer magazine is called Open and the editor is Sandipan Deb, who was also a part of the team that launched the first issue of Outlook. Will come back to fallacies of the opinion polls later. Apart from Sandipan, the print line has some familiar sounding names (I'm not too good at remembering names) - Manu Joseph, Hartosh Singh Bal, TR Vivek (the guy who didn't seem to have a liking for blogs and bloggers)  , Jaideep Mazumdar and Shivam Vij. Two things (actually three) that caught my attention first. The magazine's pages are not stapled but gummed, giving it a bit more expensive look and expensive it is, a wee bit (that is the third thing that I noticed) at Rs 30 a week. The second was the text to the right of the masthed - "The Power of Nonsense" that almost read like a tagline for the magazine and gave the reader a different first-sight opinion about the magazine. But that 'Power of Nonsense' by Manu Joseph was a fun read (I usually like what Manu writes). The layout is clean and elegant, much like the British newspaper supplements that I read at the British Library in Bhopal and so is the selection of the photographs. Something many magazines don't seem to care much about. The layout of the contents page is refreshing, unlike what we see elsewhere. Instead of wasting a page or two dedicated to indexing the matter inside, the magazine cleverly limits that to a top strip and carries stories beneath. I never liked letters from the editor that read like the contents in prose (they are so boring and have actually nothing additional to say) Would excuse Sandipan this time, it is usually necessary for the first issue. Not breaking away from the trend of Eye Catchers, Glitterati, VanityFair et al, a page where desi news weeklies serve the celebrity gossip and eye candy. Open has People. But there's nothing too catchy there and the content a little stale. In his edit Sandipan promised that they will try their "damnedest never ever to insult" my intelligence. But I already feel dumb for not being able to interpret CP Surendran's "interview" with Varun Gandhi as a satire or the real thing (Maybe my level of intelligence cannot ever be insulted, for the simple reason that it doesn't even exist). Now coming back to the cover story. Basharat Peer's experiences in Pakistan reveals nothing new. We've all been on a journey to the "country of contradictions" many times before via the varied media. And the opinion poll that is the focus of the launch issue was actually carried out in only two cities of Pakistan - Lahore and Karachi, and the sample size was 606. Like Delhi and Mumbai/Bombay cannot ever represent the whole of India, Lahore and Karachi alone do not constitute Pakistan. I might as well ask my colleagues at work and file a story stating that x percentage of Indians believe that y is the right thing to do. How conveniently most of these opinion polls ignore the opinions of the rural masses, who form a majority of the population. People's expectations from a magazine and a newspaper are different. While it is okay for us to see the text 'Continued on page x' at the bottom of a story in a newspaper, in a magazine to find something similar is irritating. And that's precisely what I found in the inside pages of Open. In a magazine it is an example of bad flow and layout. Shivam Vij's 'Edifice Complex' on Mayawati's statue erecting spree and the changing architecture of Lucknow is again (don't mind the cliche) old wine in an old bottle (Will Shivam ever get over his Maya fixation?). And having a book co-authored by your business editor as the first feature in the books section smacks of self-indulgence. Could have waited for an issue, the IPL is still a while away. The Gadgets page is insipid. I hate to see prices in dollars, give us rupees please (so what if we are yet to get a new symbol for that). 99 percent of the readers wouldn't buy their stuff from abroad. And why give prime space to a product that is available only in the US? And before I forget, I loved the piece by Akshay Sawai 'Ow!zzat!' on the importance of the abdominal guard in cricket. I was hit once, in the wrong place. Not by a bowler but a fielder who attempted to run me out. That the ball involved was what we called 'cork-deuce' made the experience a bit more painful. Ever since, I never forgot the guard. Open does manage to fulfil to some the covenant laid down by its editor. But then it is is a tough job to be a please all. I get a decent newspaper and periodical allowance (not an additional sop, just a tax saving scheme) from my employer and can quite comfortably fit in Rs 120 a month (might drop one of the men's magazines). I'll ask my vendor to add Open to my magazines list. For a month or two to begin with. As an internet person I will be looking forward to the launch to the magazine's full-fledged website. After all online is the place to be. Other Indian magazine websites disappoint me. I'm excited whenever a new publication hits our news stands. One picks up a new magazine with interest, hoping to discover something fresh with a nice layout, and articles from enthusiastic new writers and old ones in brand new avatars, maybe! Do write again and tell us more when you've been reading Open for a few weeks! PS May we know what other magazines you read? PPS Did you hear? Time is experimenting with a new format. @Abhiroop: Thanks for the info on Time magazine. And any other tech, lifestyle, news magazine that has a catchy enough cover (and some supporting content inside).